Alongside us on this crazy roller coaster through cancer, two of our dearest friends have been planted. They have joined us at appointments, surgeries, chemo cocktails, and numerous cry sessions. They have held our hands as we have ventured into the unknown, and have triumphed with us in the victories. We have worshiped together, prayed for one another, and celebrated several occasions. God brought this passionate, genuine, selfless couple into our lives at the very beginning of this battle, and we can’t imagine having forged our way through it without them standing firm and rallying beside us. He is a photographer and life-journalist by hobby. He resembles Jesus not only in his physical appearance, but also in his character. Selfless, compassionate, humble, generous, loving, and prayerful. His laugh is contagious and you’d be lucky to catch it. He is a gentleman. A leader. A father. A Christ-like friend. A true blessing. She is a dancer. Hip-hop, ballet, contemporary, and jazz. A real-life ballerina. She has a heart of pure gold. She is a friend to hold dear for a lifetime. She speaks encouragement, life, and wisdom. Her gentleness, selflessness, and caring demeanor uplifts and offers strength. She is a mother. A hospitable host. A faithful friend. A prayer warrior. A true blessing. These two have offered shoulders to cry on, words of encouragement, and a multitude of cries to Jesus upon my behalf for healing. They have documented our journey and brought life to a sometimes dark situation. Through photographs, videos, and sound recordings, they tell our story. They have blessed us more than they could possibly know. Today, we share a taste of what they have captured since diagnosis. Get your tissues ready. If this video doesn’t move you in some way, you might want to check your pulse. This montage captures a glimpse into this battle. It begins at diagnosis in January of 2012, and ends in August of 2012 on the last day of my first season through treatment. At that time, we thought I beat it entirely. Little did we know, we had another year in the trenches. Through hair loss, weight gain, and several firsts… enjoy. Stephanie Madsen | Cancer Survivor from Mark Nava on Vimeo. Yesterday morning, I woke up early and drove to the hospital for my three-month follow-up CT scan. Generally I have a fair share of “scanxiety,” yet that morning was different. Maybe my nerves were suppressed due to the overwhelming congestion in my chest, head, and sinuses, or possibly from the after-effect of two amazing vacations. Regardless, I felt confident, ready, and at peace with whatever the results would show. There still was an undercurrent of suspense as I journeyed my way to the life-changing scan, yet I suppose there always will be with every test I receive. That’s what you get with a diagnosis like mine. After choking down every last drip of the repugnant “fruit cocktail” that would light up my insides, I waited. And waited. And waited some more… Story of my life. My name was called and I was then directed to the room where the monstrous machine sat eagerly anticipating my body in its grasp. Before I laid down and surrendered to the process, I uncharacteristically asked the radiation tech to take a picture of me flexing my not-so-strong biceps beside it. Odd, yes. But, for whatever reason, I felt the urge to display my strength to the beast that has been trying to kill me. The tech laughed, the camera clicked, and I positioned myself on the scanning table, ready to be sucked into the machine. All the while, praying fervently that nothing would light up. 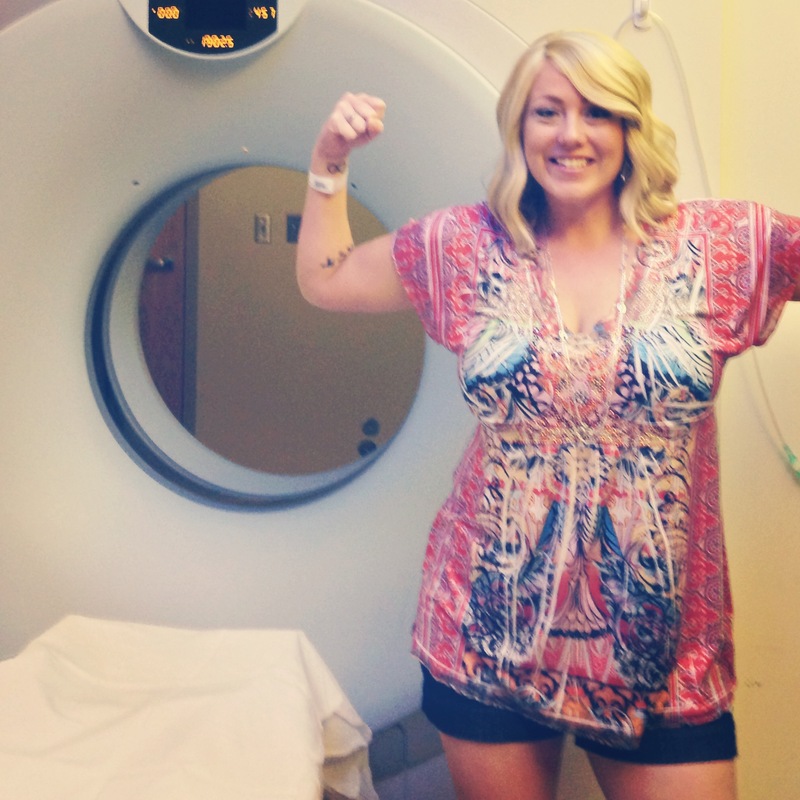 The nurses, radiation techs, and I chat frequently throughout the process of these scans. We become friends. I give them the run-down of my diagnosis, the long list of treatment, and the hope for healing that I cling to. Many share well wishes and good vibes, while several others say they will be praying with me for complete healing. After the CT machine was done spinning around my body, I was free to go. And as I said my goodbye’s and thank you’s, I caught a glimpse of my tech behind the computer that displayed the vast pictures of my internal organs. I could’ve sworn she was smiling. No matter how hard I try not to read the faces of the techs as they instantaneously see the resulting photographs from my scan, I still succumb to curiosity. This time was no different. But did I really see a smile form on her face as she examined the results? Maybe I was fooling myself. Typically, I wait about a week to receive the phone call from my doctor with results from my scans. However, barely seven hours after I had left the hospital, the number of my doctor’s office appeared on my phone screen. SHUT UP. Why are they calling me so soon? I bet all of my insides lit up, the cancer has spread, and they want to notify me that we must proceed with emergency treatment. Dammit. As I nervously answered the call, my ears began to hear unbelievable news. Even as I relive what happened less than 24 hours ago, I find myself speechless. I am in awe of God’s healing power. I am in awe of His faithfulness. I am in awe of His sovereignty. I am, yet again, cancer-free. And yet again, I am a survivor. That’s seven whole months that cancer has not invaded my body, and I am overjoyed! I remain cautiously optimistic, but nevertheless we are celebrating this victory. With every ounce of good news, there are heaping amounts of hope. I have yet to see what my future holds, but I am standing firm and believing that through The Lord’s healing power, I am ultimately healed. I celebrate this victory, and I am humbled by the hands of my Savior. He is GOOD! Continue to pray with me that cancer will no longer take residence in my body, and that the glory of God will reign.